As our flagship van, the Trooper really does have it all. It’s big. It’s got all the comforts of home. And it’ll take you anywhere you want to go. But we’ve got a few more reasons to love the Trooper as well. The Trooper’s custom 17” Cooper STT Pro tyres are the most advanced mud tyre to date. Judging from the naked eye, they don’t look that special but once you take them out on the track you realise just how amazing these tyres are. Everything about these tyres is designed to give you more traction in all conditions, from the advanced silica compound to the mud release dimples and micro-gauge siping. While the Armor-Tek3 3-ply construction provides up to 2.5 times more tear and impact damage resistance than standard 2-ply tyres. G&S Chassis manufacture the strongest and most lightweight chassis in the industry. Exclusive to Lotus Caravans, it's hot-dipped galvanised in a bath of molten zinc at a temperature of around 460-degrees Celsius. Exposing the zinc to air causes it to form zinc oxide, which further reacts with carbon dioxide to form zinc carbonate. The result is a chassis that's strong and resistant to corrosion. 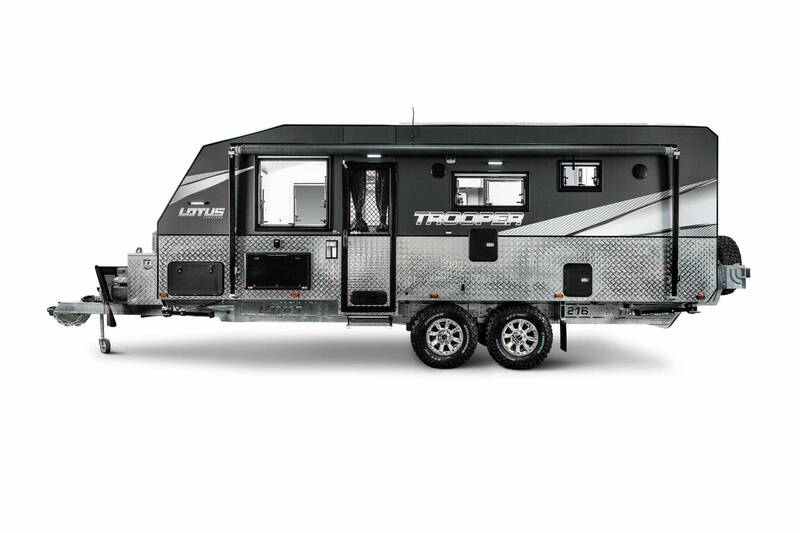 And combined with the Control Rider 3.5T Twin-shock independent suspension, it is rated to a 3,500kg gross trailer mass. If you’re game, the Trooper is packed with enough power to keep you living off the grid for a long while. Compared to a 115Ah AGM battery, the Trooper’s Redarc Lithium battery system is more than 70% lighter while putting out three times the power. Combined with the 600W of solar power, you have enough to enjoy all the comforts of home, unplugged from the rest of the world, for extended trips off-grid. Better still, the Redarc all-in-one battery management system regulates all your AC, DC and solar and displays it on an easy to use monitor in your van. It even shows the state of charge your batteries are in and how many days they have left. While you’re off the grid, you’ll need plenty of water and the Trooper has it in spades. Including 95Ltr of filtered water storage for safe drinking wherever you are, 124Ltr for general use and another 110Ltr of grey water storage to house any waste. An impressive 329Ltr in total. There are plenty more reasons to love the Trooper, see the specs here or start building your own.